Picking plump, juicy figs straight from a tree is one of lifes greatest pleasures! Ready for picking in late summer and early autumn, Perfect in a large pot or in the ground. This amazing fig is incredibly tough, easily shrugging off temperatures down to -15C in the UK. Extremely drought tolerant when established, figs do best in a brightly lit, sunny spot. Supplied as a pair of established plants in 9cm pots.about 15-120cm tall. Picking plump, juicy figs straight from a tree is one of lifes greatest pleasures, especially when served up with some wafer thin slices of parma ham and a drizzle of honey. Divine! Boasting masses of large, pear-shaped fruit with deep red flesh that are ready for picking in late summer and early autumn, Brown Turkey is perfect in a large pot or grown in the ground. Even before the fruit is ripe the large shrub or small tree adds a presence to the garden as branches are clothed with large, deeply lobed leaves. Despite originating from warmer climes, this amazing fig is incredibly tough, easily shrugging off temperatures down to -15C in the UK. 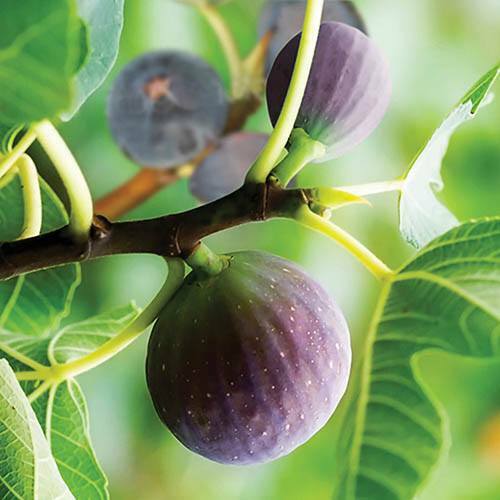 Extremely drought tolerant when established, figs do best in a brightly lit, sunny spot. Keep plants productive and compact by restricting roots by growing in large pots or planting in 60cm square planting holes fill the base with a layer of gravel and line sides with paving slabs. Supplied as a pair of established plants in 9cm pots.about 15-20cm tall.